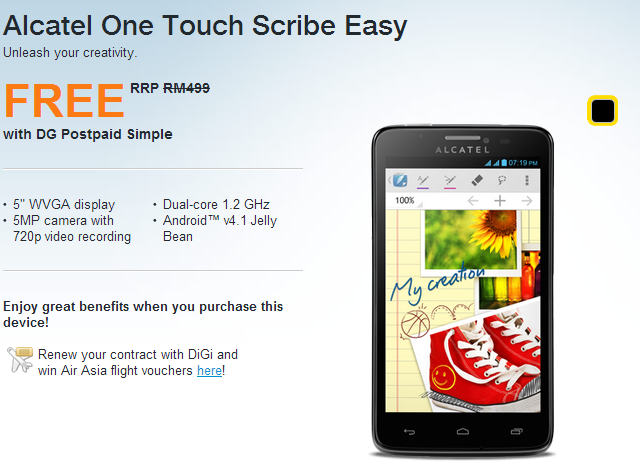 DiGi’s Postpaid Simple plan has been out for quite some time now and if you wondering if they will bundle it with any new devices, the telco has recently added the Alcatel One Touch Scribe Easy with its latest and most affordable postpaid plan. Sign up for a 24 months contract with DG Postpaid Simple at RM50 a month, along with a Mobile Internet plan, and you can own the RM499 phone from Alcatel for free. The Alcatel One Touch Scribe Easy is an entry-level Android phablet from Alcatel that features a 5” WVGA display, 5MP camera, and is powered by a 1.2GHz dual core processor. It runs on Android 4.1 out of the box and has 4GB of internal storage expandable via a microSD slot. Visit DiGi for more information about the bundle.